Once a planet Pluto needn’t feel slighted by an unflattering cosmic demotion, in my mind Pluto rivals any planetary body in our solar system. Admirable diligence by NASA’s New Horizons probe spanked antiquated notions that size matters – meager prescience became irrelevant the moment Pluto intensified before our very eyes. A dainty 2,370 km. wide (Earth – 8,000 km ), 30 times farther from our Sun, the average temperature on Pluto is minus 232 degrees Celsius. At that temperature on Earth, oceans would freeze almost to the briniest depths, our collapsed atmosphere measured as an 11 meter layer of frozen gas. 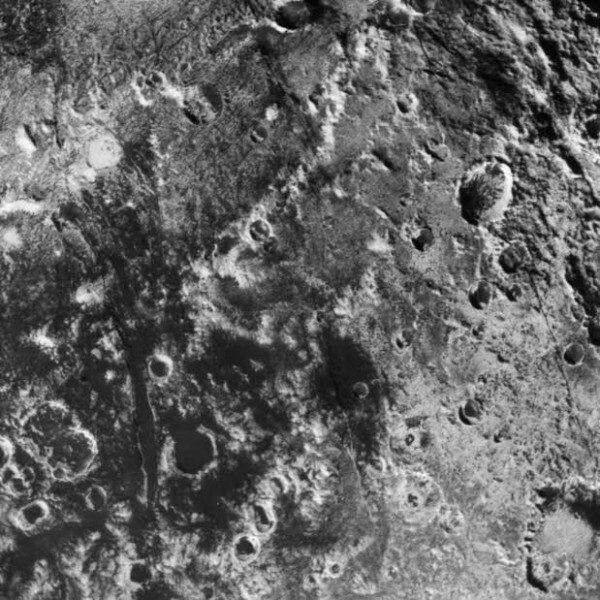 Last week NASA released images from New Horizons July 14, 2015 close encounter with Pluto. Glorious, in your face photographs defining my need to ponder the cosmos. View larger. | NASA calls this image ‘the mountainous shoreline of Sputnik Planum.’ It’s not a shoreline as on Earth, of course; it’s a place where two kinds of ice meet. 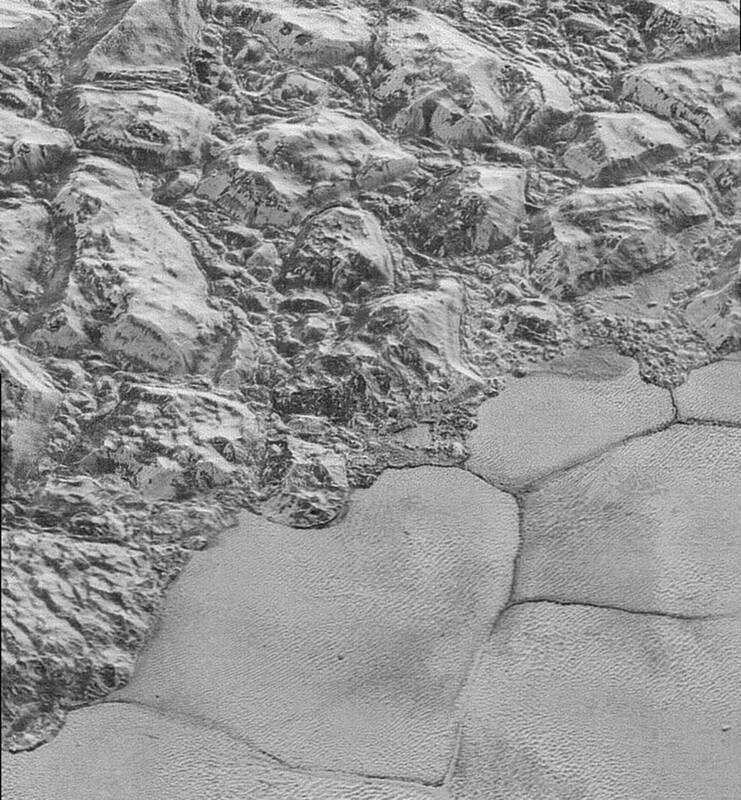 The mountainous region – informally named al-Idrisi mountains – is made of great blocks of Pluto’s water-ice crust. 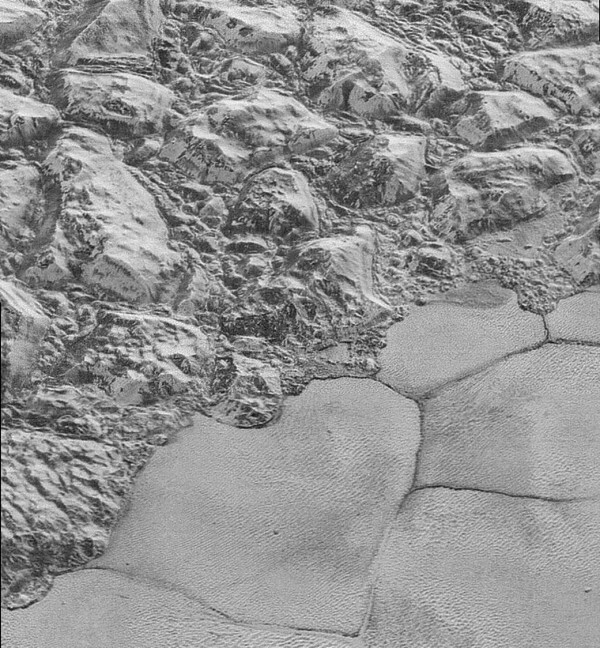 The mountains end abruptly at the shoreline of the informally named Sputnik Planum, where the soft, nitrogen-rich ices of the plain form a nearly level surface. 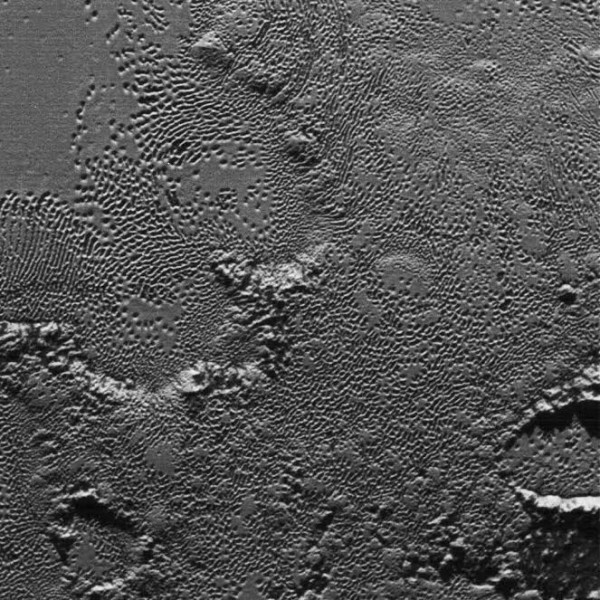 Imaged by New Horizons July 14, 2015, using the LORRI (LOng Range Reconnaissance Imager) camera. Credit: NASA / JHU-APL / SWRI. Read more about this image. Imaged by New Horizons July 14, 2015, using the LORRI (LOng Range Reconnaissance Imager) camera. Credit: NASA / JHU-APL / SWRI.